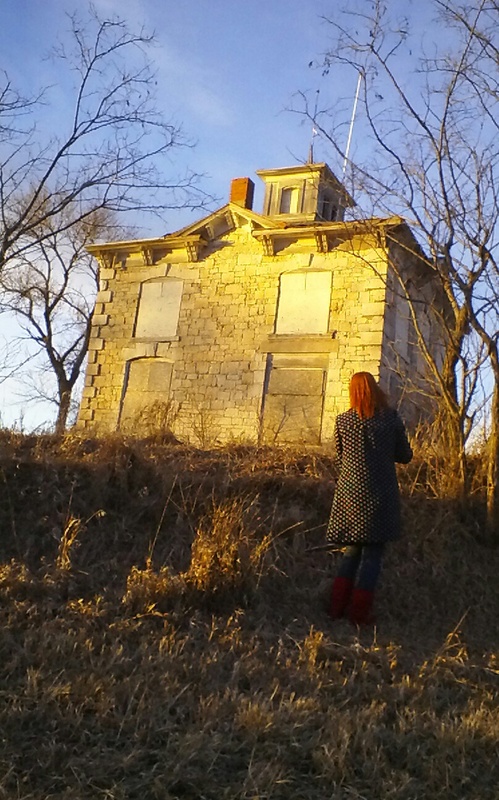 One of the first abandoned properties I came across in the area was the magnificent Beetison Manson, in Ashland, NE. This mansion was the perfect location to stumble across on a Saturday afternoon drive. The second time I went to the property, it was on a whim on my way home from Lincoln after something for one of my children at sunset. In the middle of Winter, the trees skeletal, the photo opportunity was too perfect to pass up. One reason I love finding abandoned buildings and houses is the mystery surrounding the properties and the land. Every once in a while, I can research and dig up the history on some of these places, and this particular location happened to have an interesting history. The Beetison Mansion had been in the same generation for 120 years! She was built in 1875, and each of the limestone bricks was chiseled by hand! The small tower, called a cupola, on the top was actually built as a look-out for Native Americans, and the lady of the house once carried fresh homemade bread down the hill to feed them. In 1971, the Israel Beetison Mansion was placed on the National Register of Historical Places, and since then, Iron Horse Golf Course bought the land around the abandoned house, and they said in the linked article that 60 people have shown interest in purchasing the house. Upon developing the course, they have found pottery shards, flint, tools, and other evidence of Native American occupation dating back to 1100. The owners of the golf course plan to hold an auction at some point. The Iron Horse also contains the visible wagon ruts of The Oxbow trail. One thing I must make abundantly clear is when I visit any abandoned property, I always approach with the utmost respect and caution. I do not attempt to enter these houses. The foundation is unstable, and I do not know if there is a well or a concealed cellar which could pose as a hazard, especially if I am alone. There is also the trespassing factor. I do take this seriously. Many of these locations are privately owned and it is challenging to track down the correct contacts to ask permission to photograph the structures. I take each situation as they arise, asking permission when I can. If it is a dangerous location, I stay as far away as I can and shoot from a distance. Nothing is worth risking my life. There are two other dangers to consider when exploring abandoned structures. If you believe in the supernatural, there is always the chance of an encounter and they have the potential to follow you home! In urban locations there can also be homeless people taking shelter, which is another reason to get permission from the owners when you are able. The Beetison house has a peaceful feeling surrounding it. It’s one of the locations I will return to over and over. Perhaps one day someone very lucky can restore this beautiful historical house. I also captured some beautiful images of the sunset. Not to mention, I enjoyed watching the day disappearing over the hill, giving himself over to the fair lady of night. If you share any of my images, please credit me. Thanks. Has anyone bought this place and restored it since this writing? No, it is unfortunately still just rotting away. In fact I am currently writing a book on Nebraska abandoned places and I asked the current owner permission to enter at least the entry way for photos and he said no. Even though people break in and take photos illegally all the time…and I said I would sign a waiver and would be happy with only the entryway but he said no. It makes me so sad that it’s just wasting away. 5.7.18 So, so sad that owner just letting it rot away. I’m suiting in my car across the field from it and got out my binoculars to check out the huge birds on top of it: turkey vultures! There’s a hole in the roof of the house. Why can’t the historical society save this amazing building??!!! I know, I agree completely. The history is just incredible. I would love to be able to restore the home. I think so many of us would. It is just glorious. I live in California. but still enjoyed the pictures and the history of the house. Thank you, Stephen! I am so happy to hear that! I would love to explore the abandoned in California! That would be amazing but so costly to restore it. A fundraiser maybe? Can’t imagine the cost of the lot!!! Does the state of NE have a fund for preservation of historical sites? State legislator who could help? Ashland/Gretna area fund raiser? Iron Horse HOA to restore & use for a clubhouse or meeting room or wedding receptions, etc? B&B? It’s worth looking into at some point, Cherrie. All great ideas!! Another idea might be to research and see if there are any living relatives to get involved in fundraising. Might help with the history side of it? Should we bring this to the AFD Facebook for discussion? I have been so very blessed to be in the process of purchasing a 1921 small house in Ansley Nebraska for $20,000. I am currently living in it and have been here since just after Thanksgiving of 2018. It has its problems but I feel so blessed because last year I was living in an apartment in Colorado where I was being tortured and nobody would believe me. I was forced out of my apartment and had to give $5000 worth of property away to friends including a $1500 log bed, 55″ brand new tv, several home appliances(small) and just broke my heart. I lived out of my car from April 2018 till I moved back to my home town in Nebraska. Then I lived in a small old church converted in a chapel for a few weeks and then into a very low income apartment made out of cinder blocks. That is when I found this home, started a new job and for the last two months have been able to make $1000 monthly payments. Trust me this house does need a lot of TLC but I have my own place quite and very romantic sitting with pine trees surrounding me. I love my new OLD home and feel very blessed by God to have gone through what I was forced to endure to be living here!!! Old homes are GREAT for people like myself who just wish to live a peaceful calm life!!! Hi Ronald! So happy to hear you found a home where you feel safe and comfortable! That is so very important! The place in Colorado sounds miserable!! I absolutely can believe it! I have had many experiences myself. It sounds like you went through some really tough times for awhile. I’m so glad to hear things are better! And that you love your old home!! I love them too as you know 😊. Thanks so much for sharing!